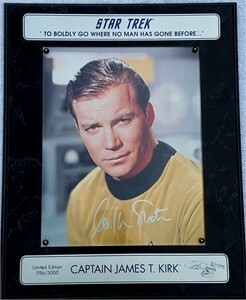 Vintage 8x10 Star Trek Captain Kirk Original Series photo autographed in silver paint by legendary actor William Shatner, mounted in a black marble finish wood plaque with metallic nameplates. HAS VERY MINOR WEAR. #596 in a limited edition of 5000 from a private signing with Score Board. With certificate of authenticity from AutographsForSale.com (original Score Board COA was lost and is not included).